Movie Review: “The Assassin”, directed by the genius Taiwanese filmmaker Hou Hsiao-Hsien (best director at this year’s Cannes film festival) is a pure delight to watch, even if its narrative is not so expeditious in making us quickly understand the context of the story as well as the function of some characters. This artistic meditation, whose lingering development covers a period of the 9th century’s Tang dynasty, is the first wuxia martial arts film by the experienced director, who returns eight years after the enchanting French-language drama “The Flight of the Red Balloon”. The story sumptuously follows a young woman, Yinniang (Qi Shu), who was highly trained since she was a kid by a princess-turned-Maoist nun called Jiaxin (Fang-Yi Sheu), now her master, in order to become an implacable assassin. The victims picked by Jiaxin are worthless persons who committed evil crimes, and Yinniang, always in black garments, slashes them without hesitation or remorse. Anyway, certain day, she fails to accomplish a mission when she spares the life of a despiteful governor who was carrying a baby in his arms. The upset master, realizing that her pupil gained matchless skills with the sword but still wasn’t totally resolved in her heart, assigns her the toughest task of all: she will have to go back to her hometown in the Weibo province, after 13 years living in exile, and kill a cousin, Tian Jian (Chang Chen), who was promised to marry her when she was 15. Once there, she'll have to deal with her own strong feelings, not only in regard to the man she loves but also to her parents who didn’t have another option at the time but entrust her to the princess Jiaxin. 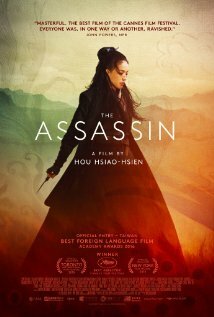 For some viewers, especially those not familiar with the director’s style, “The Assassin” may seem unexciting, extended, and slow since its long takes take the time to incisively capture the picturesque landscapes, lush costumes, and splendorous sets. Hsiao-Hsien employs winning technical aspects over a very simple plot at its core in a very sui generis way. Even the fights are exquisitely crafted like in slow motion, and you never see blood or people agonizing. The filmmaker spares us to those primitive elements, finding instead a subdued tension that slowly enraptures us. It’s a distinguished, velvety art-martial movie that needs to be praised due to its originality and refinement of processes.